SINGAPORE - Ensuring that Singapore has strong leaders in the pipeline to carry the country forward is on Emeritus Senior Minister Goh Chok Tong's to-do list. "I'm a strong believer in managed political succession," he said, adding that he hopes to help current leaders bring in new blood before he retires. Mr Goh, 77, who was Singapore's second prime minister from 1990 to 2004, was speaking at a dialogue held during a book festival on Saturday (Dec 22) where he responded to a question on what his last job for the Republic will be. In December last year, Mr Goh had urged 4G leaders in a Facebook post to pick a leader among themselves. Last month, Finance Minister Heng Swee Keat became the ruling party's first assistant secretary-general, a post that tips him to be the country's next leader after current Prime Minister Lee Hsien Loong. During Saturday's dialogue, Mr Goh said that countries, like companies, need to plan for new leaders. "Our lives are being governed by that throw... I believe each time we throw the dice, it must come up with '6' (the highest number on a dice), which means that political succession is very important for us," he said. "Policies must benefit the people so they got to spend more time understanding, on the ground, people like yourselves, people like me, how do we feel, what are our fears, hopes, aspirations, what are the livelihood issues," he said. Held during BookFest @ Singapore at Suntec Singapore Convention Centre, the dialogue was hosted by Mr Peh Shing Huei, the author of Mr Goh's biography that was launched last month. Questions asked during the dialogue were posted online, and members of the public wanted to know what Mr Goh's happiest moment as prime minister was (when the ruling party won 75 per cent of the vote in the 2001 General Election so he could think about stepping aside for new leaders), whether he ever thought about joining the opposition ("not even for a second") and his regrets in life (not picking up his mother tongue language Mandarin). Mr Peh, who had won the Singapore Literature Prize in 2016, was a former news editor at The Straits Times and is now the co-founder of content agency The Nutgraf. 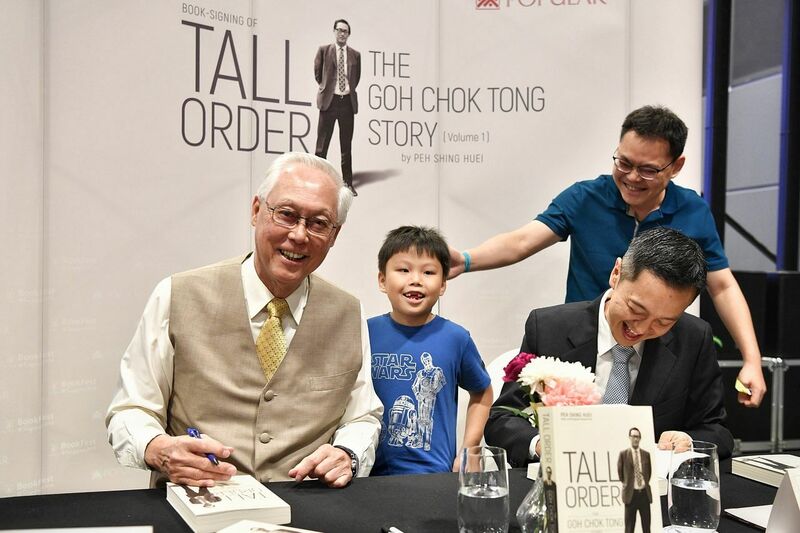 Mr Goh's biography tells of the former prime minister's boyhood days, Singapore's maiden leadership renewal process and the highs and lows in his career. Published by World Scientific, the 344-page book is the first of two volumes.